"I am looking for some tools to download Spotify music for offline listening. It seems that it is illegal to remove DRM from Spotify according to the Euro and American copyright laws. I really don't want to run into any trouble of copyright issue. Is there a way to get Spotify losslessly in a legal way?" That is right Spotify doesn't officially allows cracking its DRM music. 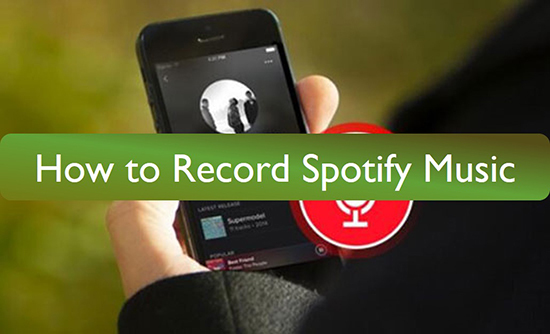 But if you just record music from Spotify, it will be totally OK. You can use any best Spotify music recorders offline or Spotify web recorder. One thing you need to note is that not all tools are created same. Hence, you may get different output audio quality. To make sure you get best output quality effectively, you can try these two ways to record Spotify losslessly. 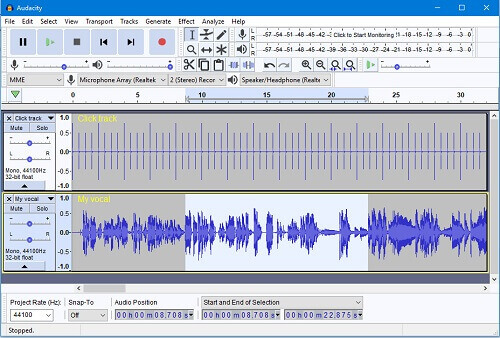 Audacity is a free and open source audio recording and editing software. It works well for Windows, Mac, Unix systems and so on. It has the features of adding audio effects, multitrack mixing. The best feature is that it has the auto noise reducing feature which can help you record audio files without extra noise. That is a huge advantage compared to any other free audio recorders in the market. Step 1. Open Audacity from your Mac or Windows computer, you will see its main screen. Step 2. Launch Spotify app and start to play a song you want. Step 3. Click the red recording button, it will start to record your song in real time. Step 4. When it is done, you can click the black stop button to end the recording and you can do some editing such as cut the unwanted parts out. Step 5. You can click "File" > "Export" > "Export as MP3" or "Export as WAV" to save the Spotify song. 1. Powerful editing features such as trim, cut, draw, zoom, copy and so on. 2. Supports to record music from any sources in theory such as Spotify, Tidal, Deezer, SoundCloud, Apple Music, iHeartRadio, Pandora. 3. Support compressed formats MP3, FLAC, OGG and uncompressed formats AIFF, WAV. 4. It is totally free. 1. The software is kind of difficult to use. It takes some time for you to learn and handle the software. 2. It takes real time to record songs one by one. If you just record a few songs, the Audacity free music record will be good enough to help you. But what if you have hundreds or thousands of songs? Obviously no one will like to spend days or months to sit in front of a computer to do that. 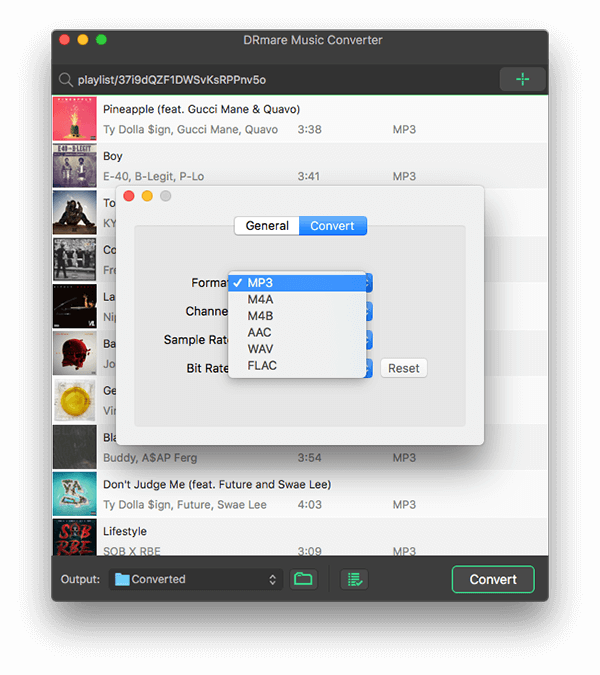 Fortunately, you can also try the third party Spotify Music Converter for Mac from DRmare software to record songs in batch. After its debut, it has been polished for multiple times in the past several versions. The latest version use the background acceleration recording technology by a standalone virtual sound card, so it is completely legal to use. And this virtual sound captures the audio before it is played on your computer, so it won't be affected by the noise on your computer such as clicking or any sounds from other programs. 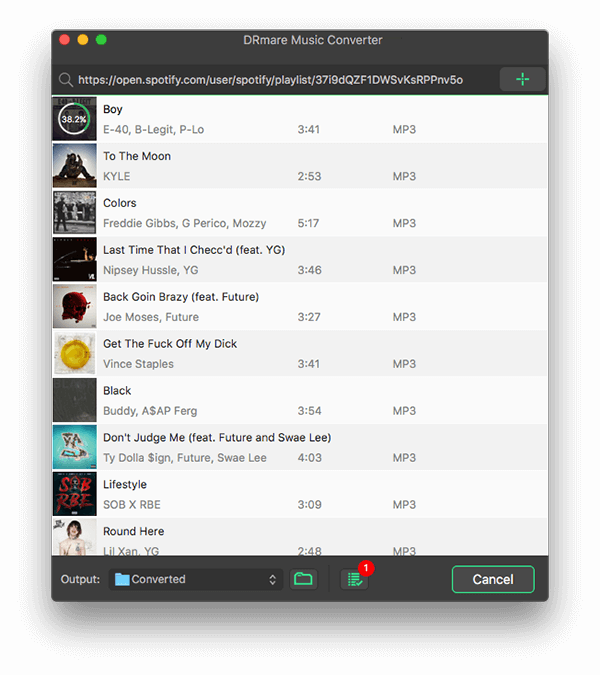 The trial version allows you to evaluate it for free, please download the software and let me walk you through on how to use it to record Spotify on Mac or Windows. It supports to record songs from the Spotify free account. If you have the premium subscription, it will keep the 320Kbps quality. DRmare software has the best integration with the Spotify app. After opening DRmare software, you will see Spotify app opens as well. 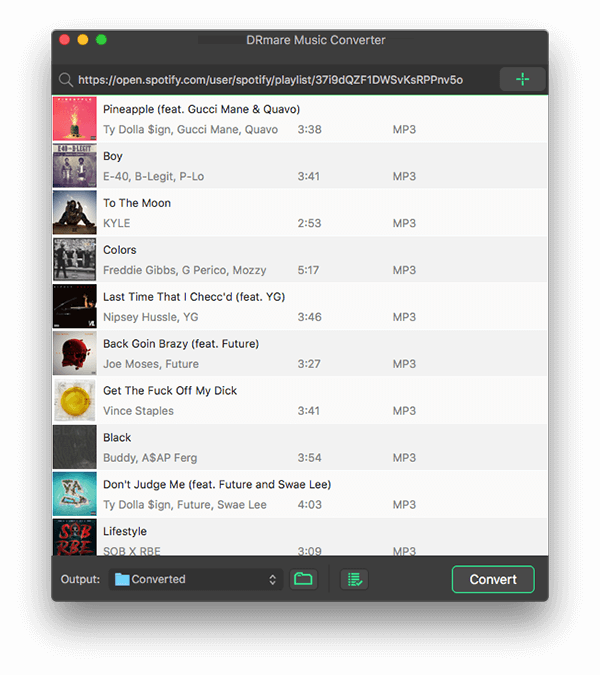 Then you just need to drag & drop the songs, playlists you want from Spotify to DRmare. You can add up to 100 tracks at a time. If you'd like to have best compatibility on the output audio files, you can choose MP3 format. Else if you'd like to keep 100% lossless quality, you can choose a lossless format WAV. The WAV will take up significantly large space on your computer, so please make sure you have a big enough hard drive. 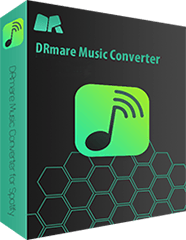 Finally, you can select an output folder and click "Convert", DRmare software will help you record songs automatically. If you have a lot of songs, you just need to let the software to convert by itself without wasting your time. 1. Batch convert up to 100 songs at a time. 2. Lossless output quality and 5X converting speed. 3. Easy to use easy interface, best user experience. 4. Archive your output songs, keep your music library organized. 1. It costs $29.95 to buy a lifetime license.